Almalexia is one of the three Tribunal immortals, who resides in Mournhold, rarely leaving her High Temple. Almalexia appears as "alm" in Almsivi. She seems to be taking her decline of power (due to being deprived of the Heart of Lorkhan) rather badly, and according to Galsa Andrano, Almalexia has become increasingly insane. The insanity has caused paranoia, and the goddess has become suspicious of King Hlaalu Helseth, but he isn't currently her major focus. "Nerevarine. Here it ends. This Clockwork City was to be your death. You were to be my greatest martyr! The heroic Nerevarine, sacrificing all to protect Morrowind from the mad Sotha Sil. But you live! You live! Fear not. I will tell the tale myself when this is done. I will tell my people how with your dying breath you proclaimed your devotion to me, the one true god. Your death will end this prophecy and unite my people again under one god, one faith, one rule by my divine law. The puppet king will lay down his arms and bow to my will. Those who do not yield will be destroyed. The Mazed Band has allowed me to travel to this place. Here, I slew Sotha Sil. Here, I summoned the Fabricants to attack Mournhold. I will be the savior of my people! I alone will be their salvation! None may stand in my way. Not you, and certainly not Vivec. He is a poet, a fool. I will deal with him when I have finished with you. And Sotha Sil...he always thought himself our better, shunning us, locking himself in this hole. He spoke not a word as he died. Not a whisper. Even in death, he mocked me with his silence! But I think you will scream, mortal. For now, you face the one true god." "So you are the person I have been hearing about. I welcome you to my chapel, %PCName...or perhaps I should call you by another name? But, that is a discussion for a later time. I understand you have done well in my service, and, indeed, a service in my name is a service for all of Mournhold. Now, my faithful and obedient servant, let us discuss Barilzar's Mazed Band." "Greetings, %PCName. It is good to see you again. Dear Fedris has told me more about your work so far here in Mournhold. He suggested I might find your services useful. After some consideration, I have decided that there may be a task for you to complete." "What have you learned about this End of Times cult and their beliefs? Have you served me well in gathering this information?" "In My wisdom I have sent you to activate the Karstangz-Bcharn. Tell me you have accomplished this task for your goddess." "I am well-pleased, good and faithful servant. My people look upon the elements, and see there written a divine testament to my lordship. Did ever any other god display such dominion over the earth and sky? But now... with a heavy heart, I must lay a sad burden upon you. I bid you bring the peace of understanding to my Missing Hand. "Have you eliminated the threat of my poor, mad Missing Hand, and brought peace to Mournhold?" "Welcome, %PCName. It is time we talked of greater things. I have watched you since your arrival in Vvardenfell, and you have been a strong and faithful servant to me. None but the Nerevarine could have succeeded as you have. How long I have waited for this! My Nerevar, returned to me at last! I have watched from my Temple as others have made the claim, and I have seen them fall. I believe now that you are the one who was prophesied." "Greetings, my dearest servant. You were to forge the blade of Nerevar once again." "It is time for you to go, %PCName. Sotha Sil must be stopped." [Powered Dwemer Coherer has been added to your inventory.] "That's correct. While these storms may be common on the island of Vvardenfell, they do not occur here, so far removed from the Red Mountain. Now, though, they will, and these heretics will understand the power of the Tribunal. The power of Almalexia! Take this, and use it to activate the machine. You will have to divine its workings on your own, %PCName, but I believe you are up to the task." "You have not yet created ashstorms, %PCName, and my patience wears thin. This needs to be handled, and quickly." "Yes, the Karstangz-Bcharn is creating the weather just as I had hoped. And it will remain this way until I am satisfied these people have learned a lesson." "Yes...the mother to young King Helseth. A fascinating woman. Mortal, but fascinating. "I was told you had the Mazed Band. Where is it? Retrieve it. Quickly." "An interesting item, is it not? It seems ordinary enough, but it is much more. The ring is cold now, but the embers of its power still burn hot within. I will use my magic to reawaken this power." Why did you want this ring? [Barilzar's Mazed Band has been removed from your inventory.] '"Do not concern yourself too deeply in these matters, friend %PCName. I will use the ring as I do everything...to serve the Temple and all of Morrowind. You have been a pleasant surprise to meet. I have seen something in you that I have not seen in a very long time. I bestow the blessing of My Light upon you. May it serve you well. We will speak again soon." It is my pleasure to serve you. [Barilzar's Mazed Band has been removed from your inventory.] "It is I who serve all of Morrowind. Your help has been appreciated, %PCName. I have seen something in you that I have not seen in a very long time. I bestow the blessing of My Light upon you. We will speak again in the future." "It is good and right that the Band be in my possession. Surely, it will be a boon to all of my people. Your efforts are appreciated." "They would dare...? So, the Tribunal has lost its power, has it? These fools would dare question Almalexia's power, here in her city! I will give them a lesson in power, %PCName, and you will be my agent." "This cult will be gone from my city soon, %PCName. I cannot allow such heresy to poison the minds of my people." Clockwork City: "His lair is as puzzling as the mind of the Sorcerer himself. Ever-moving, ever-changing, its levers and gears responding to its master's will alone. It is here he performs his profane experiments, aided by his magic and tainted by his madness." craftsmen: "You'll find a number of them in my fair city. It was these artisans who built this city from ruins under my guidance. This glorious temple was erected by men and mer of stout heart and strong faith. If any in this land can forge that blade, they'll be found in my city." "Very little is known about them yet, but there is one very disturbing fact we have learned: many of their members have been found dead." "Have you found out more information yet?" "They will not continue to exist in my city." "The leader of this little cult. He resides in Mournhold, though he is not known to have a permanent residence. He is dangerous, %PCName, as he spreads discontent among my people. He is not to be killed, though. I want no martyrs to this madman's cause." "We know he is in the city, but little else about him." "I will take care of him." "Dear Fedris has been my loyal servant for a very long time. He is my Steward, and he oversees many of the day-to-day activities here at the Temple." "Fedris Hler has been found dead. Murdered, it seems. That anyone would dare do this in my Temple.... My Hands will find the murderer, and he will be dealt with severely." "The best weaponsmiths in all of Tamriel reside in my city. When you have recovered the pieces of the blade, seek out the finest among these craftsmen, and press him into our service." "The blade is reforged! Our time has almost arrived. There is but one obstacle that stands in our way, though it pains me to believe it is so. Sotha Sil. I cannot count the times I have fought by the Magician's side. It was he who stood with me the day I fought in Mournhold and banished Mehrunes Dagon to the depths of Oblivion. It was Sotha Sil who was able to delve the mysteries of Kagrenac's tools, and raise me to my rightful station. Now, though, the Tinkerer has become unstable." found dead: "At least seven of them have been found so far. All dead, all in their homes. It appears they ingested a strong poison, and not even my magicks could revive those who were found. We must find out what drives this group, and rid my city of their presence. Speak with Meralyn Othan at the Great Bazaar; her brother Sevil was one of those found. Learn what you can about them, %PCName, and of this Eno Romari. Take care with him, though. The words of a martyr cry louder than those of a zealot." "My dear Gavas has been a loyal servant of mine for many, many years. He is a shining example of the glory of the Tribunal." "My dear Gavas has been found dead. My Hands will find out who has done this horrible thing, and that person will suffer. That someone would dare do such a thing in my Temple...."
Hands of Almalexia: "The Hands of Almalexia are My personal guard, pledged to honor and protect and serve Me in all ways. Their bodies and souls are buttressed by My Divine Favor. Their armor and weapons are imbued with glory by My Touch. On the face of Tamriel, there are no more terrible warriors than My Hands of Almalexia." "Helseth is the King of Morrowind. He is young, and has much to learn. Soon he will learn the strength of the Tribunal Temple, and its importance to all my people." "I have heard that young King Helseth has been murdered. I do not like these things happening in my city." High Ordinators: "My High Ordinators protect the city of Mournhold from any who would do it harm. They are holy warriors, blessed with great speed and strength." his madness: "I have suspected for some time that the Lord Sotha Sil had entered Sheogorath's realm. His visits have been more and more infrequent, and punctuated by violent fits of anger. He began to speak of the fall of the Tribunal and the return of the Old Gods. But Sotha Sil is not a Seer; he is a Maker. He shapes the Here and the Now, while only I have been privy to what is to come. I know this...he is no longer the man he once was." "Loosely translated: the Weather Witch. At its height, the Dwemer civilization was masterful in the use of machinery. In a time of drought, Dwemer scholars were commissioned to create a machine that would bring rain to their lands. They created the Karstangz-Bcharn. Its existence was little more than a myth until recently, when the ruins opened beneath my city. I wish for you to activate the machine, make it to create ashstorms in Mournhold. Then, these heretics will know the power of Almalexia!" "Go. Take the Dwemer Coherer and restart the machine. I will have ashstorms in Mournhold!" "I see you have restarted the machine, but this is not what I asked for! This weather is not uncommon in the city. Only an ashstorm will show these people my true power." "Well done, %PCName. This is the effect I was looking for! Ashstorms in Mournhold! My magic will prevent anyone from further tampering with this machine. You will, of course, keep silent about this. My powers are a bit drained, mortal...they are not gone. My ordinators will take care of the remains of this End of Times cult and their leader. You have done well." "It will remain active until I decide otherwise. The ashstorms will continue in Mournhold until I feel that these people have grown to appreciate all I do for them." lesson in power: "These fools must be reminded of the true power of a god. Since the attack on the city, much of my own power has been spent caring for my people. The number of wounded has been astronomical, and caring for them all has been taxing to even me. Still, I must demonstrate to these people what it is to mock the will of a god. You will travel to the ruins of Bamz-Amschend and activate the Karstangz-Bcharn." man he once was: "He is completely mad. It was his creations, these Fabricants, that attacked my city. This once great man is now a danger to Mournhold and to all of Morrowind. He must be stopped, %PCName." Meralyn Othan: "Look for her in the Bazaar. Find out what she knows." "One of my most faithful guards, one of my very own Hands of Almalexia, pledged to honor and protect and serve me in all ways, has lost his mind. Salas Valor has abandoned me, and now spews vile and slanderous untruths about me to any who would listen. I pity him, and know he is not responsible for his actions. To view the splendor of a god may drive even the strongest mortal mad. But now he presents a threat to us, and he is very dangerous. I fear you may not be able to spare his life. Now Salas Valor haunts the streets and sewers of Mournhold. His wild, distracted manner frightens the people, but even my Ordinators are afraid to confront so terrible a weaponmaster and war-wizard. I beg you -- seek out Salas Valor. Relieve us of this threat to my beloved people, and bring peace to my sacred city of Mournhold." "When you have removed the threat Salas Valor represents to Our peace and security, report back to me." "You have done well in removing this threat to Our peace and security [sic]"
"I believe it is your calling to stop Sotha Sil's mad schemings. I do not know that he can be reasoned with, %PCName, but it is possible. If he cannot be, you must end his life. Though the idea saddens me, it is best for Morrowind...and it is best for him, as well. You have the power to do this. The Trueflame can kill a god, if wielded by one of noble intent. Steel yourself, %PCName, and do what must be done. I will send you to his Clockwork City now, if you are prepared. Good luck, Nerevarine." "Are you prepared now to stop Sotha Sil and take your place amongst the gods?" "As I said, they are nearby. Look to those in the city that you know and trust for guidance. Find those who would have use for items such as this. Prove your mettle to me, Nerevarine, and soon we will stand together once again!" reclaim your station: "For years, the Chimer and the Dwemer had been at war. The Dwemer spurned the Daedra that the Chimer worshipped, instead placing their faith in their metal creations. It was only when the Nords invaded Resdayn that the two nations were able to join as one, under the leadership of our Nerevar and the Dwarf-King Dumac. In time, the two generals became blood friends, and on the day that Nerevar and I were wed, Dumac presented us with twin blades, Hopesfire and Trueflame." Royal Guard: "The king's guards? I don't concern myself with them. My Hands are the most powerful warriors in all of Mournhold." Salas Valor: "Salas Valor was once my most trusted Hand and faithful servant. But recently his behavior has been erratic. He has been quiet and unresponsive. I am afraid... I may have allowed him to come too close. It is impossible that a mortal and a god might meet on equal ground, but... perhaps he had deluded himself. I regret his lamentable state, and am sorry that I may have been partly responsible for his condition." Sevil: "Meralyn Othan's brother. He was found dead, just like the others." "Do not concern yourself with Sotha Sil. He lives in his own way, as he always has. No, I have not spoken with him in a long time, but this not odd. I'm certain all is well with my old friend." "Sotha Sil. I cannot count the times I have fought by the Magician's side. It was he who stood with me the day I fought in Mournhold and banished Mehrunes Dagon to the depths of Oblivion. It was Sotha Sil who was able to delve the mysteries of Kagrenac's tools, and raise me to my rightful station. Now, though, the Tinkerer has become unstable." "Once, Sotha Sil was like we are, the Lord Vivec and I. He spent time among these mortals, instructing them, counseling them, protecting them from harm. He may have loved them more than any of us, though I know not why. It has been many years since any have seen the Sorcerer, though. Many more since he took initiates into his service. I believe he grew weary of mortal imperfections, and retired to his Clockwork City, where he reshapes life, and some say the very world, into an image he finds pleasing." task: "Since the horrendous attack on the city, there have been some alarming developments. One of the most troublesome has been a cult that has recently formed, led by a young Dunmer named Eno Romari. They call themselves the End of Times. In these troubled times, I fear the cult is gaining in popularity." "He's the leader of the young king's Royal Guard, I believe. An Imperial. They're all the same." "I heard Captain Delitian had been murdered. Surprising." [Broken Dwemer Blade Piece has been added to your inventory.] "The Blade of Nerevar. In the battle beneath Red Mountain, Trueflame was shattered, the flame extinguished, and in the confusion, the pieces lost. It is time for you, Nerevarine, to remake the blade and take your place by my side once again. I have only one, which I now give to you. Through my magic, I have been able to determine that the other pieces of the blade are nearby. Find the other two pieces of the blade, and forge the blade anew. Only you may accomplish this, Nerevarine." "Oh, how it burned with power! You must find the pieces and forge the blade once again." "The blade turns bright again!" "Each was a magnificent blade, the pinnacle of Dwemer craftsmanship. Their blades burned with an unearthly fire, and the sight of them struck fear into our enemies. My blade has been kept safe, but not so Trueflame, the Blade of Nerevar. It was lost at the battle of Red Mountain." you are the one: "I believe you now to be the Nerevarine. Though I have watched others come and go, my belief is that you are the child of prophecy. The time has come for you to reclaim your station. Together we can unite Morrowind once again, free from the Imperial yoke." Barilzar's Mazed Band: Find this powerful artifact hidden beneath the Temple and return it to Almalexia. The Missing Hand: Take care of one of the Hands of Almalexia who has abandoned his post. 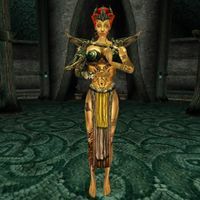 Almalexia is technically listed as a creature in the Elder Scrolls Construction Set, so spells such as Calm, Command, Demoralize, Frenzy and Rally all use the "Creature" version and she can be Soultrapped, provided you have Azura's Star empty in your inventory. Almalexia is noted for having the largest soul in not only Morrowind, but also both of the expansions, even larger than that of Vivec. Almalexia has no hand-to-hand attack. If her sword breaks, and she has no magicka remaining, she will just chase the player around the room, unable to do anything else. If you choose to break the storyline and attack Almalexia in the High Chapel, you will not incur a bounty. Although the powerful Hands next to her will attack you, the rest of Mournhold will not even bat an eye. When she ambushes you in the Clockwork City she is wearing a mask similar to the Daedric Face of Inspiration. This page was last modified on 18 October 2018, at 10:12.